Butter Me Up. | A.B.E. Remodeling, INC. Totally off the subject of home remodeling but you already know that home improvements is what we do!!!!! I saw an article about butter and thought I'd repeat some of the information. Are you for butter or against butter?? *For attractive individual butter servings, squeeze butter through a pastry bag or plastic beg onto a cookie sheet, set in refrigerator to harden. *To bake the perfect potato, rub butter over potatoes before baking to prevent skin from cracking and to improve the taste. *Butter will go farther and have fewer calories per serving if you beat it well. This increases the volume by adding air. *Did you know that butterfat is 30% monounsaturated fat? That's the same kind of healthful fat found in olive oil and canola oil. Besides being irresistibly flavourful, butter is a source of vitamin A, a nutrient important for healthy skin and eyes, as well as for strong bones and teeth. *How does butter get its mouth-watering colour? The answer is perfectly natural! Butter is yellow because of the natural pigment carotene. Carotene is also why butter is a source of vitamin A. Carotene comes from the cows' diet, which consists mostly of hay, silage, grains and cereals, which are converted by our body into vitamin A. Very rarely, more carotene, or another related natural pigment, is added to butter to enhance the yellow. 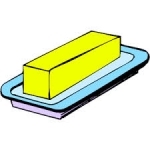 This added pigment appears on butter labels as "colorant". The first reference to butter in our written history was found on a 4,500-year-old limestone tablet illustrating how butter was made. It is generally believed the word butter originates from the bou-tyron, Greek for "cow cheese", however it may have come from the language of cattle-herding Scythians. Butter was used as food by ancient tribes of Asiatic India, as well as for burning in primitive lamps and smeared on skin to protect from the cold. In early times, unlike today, butter was so costly it was used in religious ceremonies. It still is today in India and Tibet. In ancient Rome, butter was valued cosmetically. Not only was it used as a cream to make skin smooth, but Greeks and Romans massaged it into their hair to make it shine. Much esteemed for its perceived healing properties, butter was also used in poultices to fight skin infections and burns. The ancient Egyptians even valued it as a cure for eye problems. During the T'ang Dynasty in China, clarified butter represented the ultimate development of the Buddha spirit. The ancient Irish, Scots, Norsemen and Finns loved and valued butter so much they were buried with barrels of it. Let me know if you found any part of this to be of interest. Are you a true butter user or is margarine your choice ?